Thiruvathira is a Hindu festival celebrated in Tamilnadu and Kerala. Thiruvathira also called Thiruvathirai or Ardra Darshan. Arudra Darshan is observed in the month of Markazhi (Margashirsa) on the full moon day (Pournami or Purnima). In Kerala, Thiruvathirai is celebrated in Dhanu Month. It is believed that the Lord Nataraja, the dancing form of Lord Shiva was born on this day and it is considered as highly auspicious. On this day Ardra Nakshatra coincides with Pournami and it is the longest night in a year. The dance of Lord Shiva in the form of Nataraja represents five activities – Creation, Protection, Destruction, Release and Embodiment. It represents the continuous cycle of creation and destruction. The cosmic dance takes place in every particle and is the source of all energy. The first Thiruvathira after marriage for a woman is called as Poothiruvathira or Puthen Thiruvathirai. Arudra signifies the golden red flame and Lord Shiva performs the dance in the form of red flaming light. Most of the temples around the world with Lord Nataraja and Shiva would celebrate Arudra Darshan. 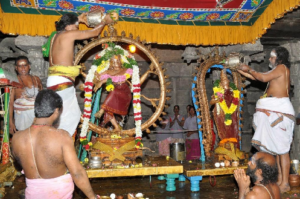 The most important thiruvathira festival takes place at the Chidambaram Shiva Temple in Tamil Nadu. The cosmic dance of Lord Shiva is enacted on the day. Chidambaram is considered as one of the five places that represent the Pancha Maha Bhootalu (Fire, Air, Water, Land and Sky). In Tamil Nadu, the unmarried women will fast on Thiruvatirai day. They will take food before sunrise and start their fasting and they will break the fast after witnessing the moon rise. Some people also start fasting (Nonbu) nine days before and ends on Thiruvathirai day. In Kerala, Thiruvathira is an important traditional festival along with the other popular festivals, Onam and Vishu. This has been celebrated by the Nambuthiri, Kshatriya and Nair communities of Kerala. The unmarried women observe a partial fast on this day to get good husbands and married women take a fast from the preceding day (Makayiram Nakshatra) and on the day of Thiruvathira for the well being of their husbands and family.